West Lebanon — Janet Bailey took control of the four-seater Cessna 172 airplane Monday morning as it rumbled forward on the runway at Lebanon Municipal Airport. With the pilot’s gentle coaching, she pulled back, back, back and the plane lurched up, up, up — and suddenly, the woman who had celebrated her 82nd birthday only days earlier was in the air, flying again, piloting a plane for the first time since she took flying lessons at that same airport 60 years ago. She began to laugh, and for some time as she helped navigate the small plane’s ascent, the other three people on board laughed with her, everyone giddy. No words; just laughs and giggles filling the cabin. Later, her longtime friend, Rosie Holmes, beckoned from the back seat. “This is something you’re never going to forget, right?” she asked. Bailey struggles to remember these days. She began displaying symptoms of Alzheimer’s disease a few years ago, receiving an official diagnosis in 2010. But she has never forgotten her love of flying, a dream she abandoned at the behest of her father, who couldn’t picture his daughter building a life as a pilot and worried about the costs associated with the lessons. 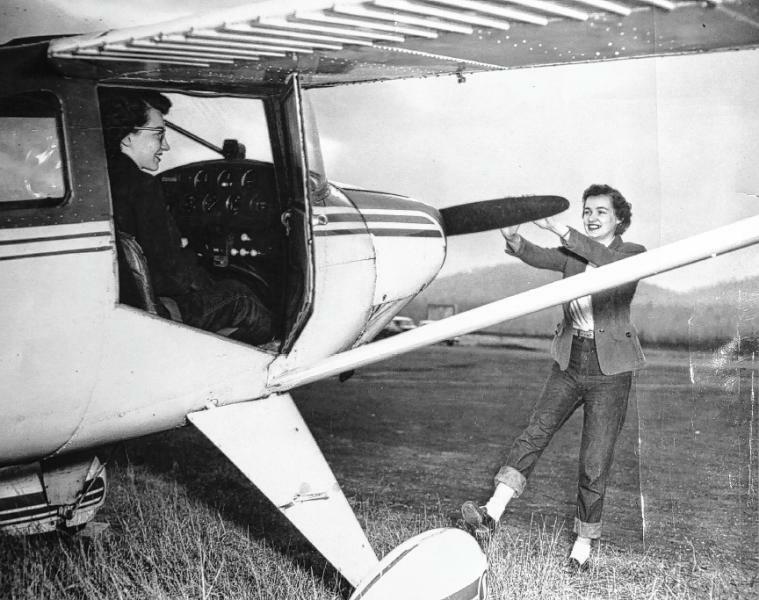 Bailey’s appraisal of the situation was more concise: Her father, she said, “threw a fit.” Although Amelia Earhart had finished her trans-Atlantic solo flight nearly two decades earlier, this wasn’t a day and age where female fliers were the norm. Her “claim to fame,” she said, was her three hours of solo flights — a significant landmark for aspiring pilots en route to earning their licenses. But even though she had already moved away from home, graduated from college and was on her way to achieving her dreams, her parents’ perspective was important to her. Smart and educated — she graduated from St. Johnsbury Academy in 1949 and Fisher College in ’51 — she earned a secretary position and built a 45-year career at the hospital that would become Dartmouth-Hitchcock Medical Center. Until Monday, she never flew again — not even as a passenger. Friends and family began to realize something was wrong a few years ago, Sloane Bailey said, as they noticed lapses in Janet’s memory. It was unusual for her to forget her nieces’ and nephews’ birthdays, and she would sometimes forget to eat, which led to problems with her blood sugar and blood pressure. Then, a few months later, she inquired about Sloane’s sister. Sloane’s only sibling is a brother. Family members began visiting more often to check up on her at her home in Lebanon, where she lived alone, and Janet Bailey eventually took a short residence at an assisted living home. But it wasn’t a good fit, and last summer she moved into Westboro House, on West Lebanon’s Elm Street, where her physical health began to improve. Alzheimer’s disease has taken the greatest toll on her short-term memory. During the hourlong flight on Monday, she paused several times to tell pilot David Kent that she was raised in tiny McIndoe Falls, Vt. But family members say she is cognisant of her memory loss, and her long-term memory has largely persevered. She hardly missed a beat answering Kent’s many questions about growing up in the little riverside town near Barnet, Vt., recalling the family’s home in the town center, her father’s experience running an auto garage, her one-room schoolhouse education, spending time with her older sisters and younger brother. And, of course, she remembers her time in the sky. Even in recent years, as her Alzheimer’s progressed, Bailey would often crane her neck upward, telling whoever she was with how much she would like to get back up in the clouds. Sometimes Holmes, her longtime friend, would drive the duo to the airport in West Lebanon, just so they could watch the planes taking off and landing. 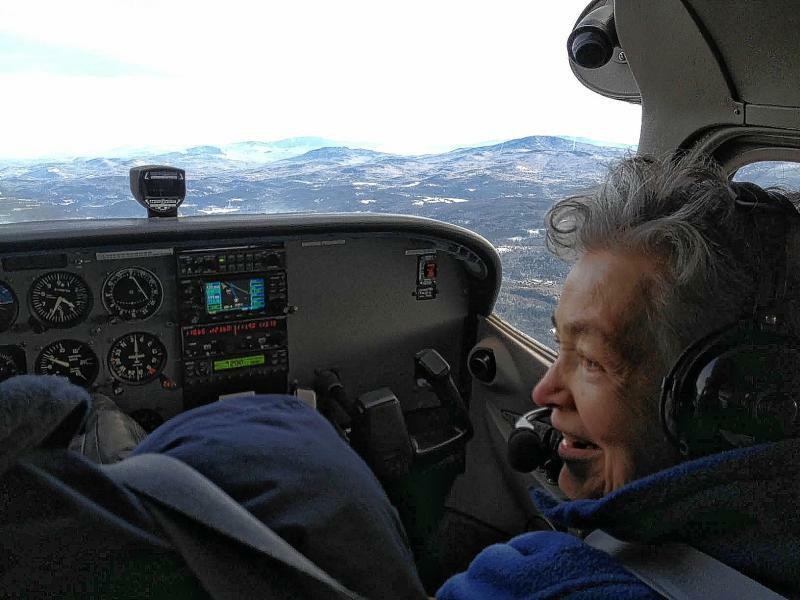 Janet Bailey, 82, during a private flight on a Cessna 172 airplane that departed from Lebanon Municipal Airport on Monday, Jan. 21. Photo by Maggie Cassidy for the Valley News. The tiny Cessna journeyed over the frosty White River, where large chunks of ice floating downstream looked like tiny flakes of sugar. It passed over South Royalton — a “metropolis,” Kent called it — and Hanover and Woodstock, too, each reminiscent of tiny toy villages sprinkled with fake snow. A solar array in Sharon looked like strange patches of foil. In the distance, Killington Mountain appeared to have been drawn onto the sky. Soaring at 150 mph more than 3,000 feet in the air, they passed over the road along the Connecticut River in Lebanon where Holmes and Bailey met as neighbors more than 40 years ago. Holmes pointed it out, and Bailey remembered. Janet Bailey had gotten back in the air — but first, she had brought her family back together. When she awoke Sunday morning, she was surprised to learn that not only was she scheduled to fly that day — a surprise treat for her 82nd birthday, which was Jan. 15 — but she also would be greeted by more than 20 of her loved ones at the airport, including six nieces and their children and spouses, and several of Bailey’s closest friends. Despite never having children of her own, Bailey has played an important role in her extended family: Each of her brothers and sisters succumbed to cancer in mid-adulthood, and she gradually “adopted” her 16 adult nieces and nephews after their parents died, they said. She acted as a connecting point, unwavering in her cards and typewritten letters, a format she favored from her secretary days. They traveled to Lebanon from all corners of New England last Sunday to wish their aunt well during her flight. Sloane Bailey, who organized the flight through Leading Edge Aviation, drove up from northern Virginia. Forming a large, bustling group in the airport lobby, some of Bailey’s nieces were seeing each other for the first time in nearly 18 years. “It’s really bringing us all together. We haven’t seen each other as much as we would like,” said Hinds. Another niece, Jennie Gawlak, drove up from Connecticut for the event with her 15-year-old daughter, Annelise. Finding out that Sloane Bailey had organized the private flight was “just wonderful,” she said. For her part, Janet Bailey said she was “flabbergasted” by the surprise. As fog crept in, it was time to return to West Lebanon. Kent pointed the plane south and followed Interstate 91 back toward the airport, initiating the plane’s descent. Back on the tarmac, with her niece and friends nearby, Janet Bailey extended her arms wide, flitted her fingers, and trotted in a small semi-circle. “I may go around like this all day,” she laughed. Once again, everyone else laughed with her. She was back on the ground again, but she hadn’t stopped flying.